Controlling heat in the grow room is one aspect of growing marijuana indoors that can be difficult for many of us growers. Grow lights provide our plants with lots of life-giving light, but they also produce heat, and big grow lights can produce a lot of heat! Most cannabis plants start suffering when their temperature gets over 80-85°F (27-30°C), so it's important to keep your grow space below that threshold. This tutorial will teach you tactics that you can use to control temperature and fix heat problems. 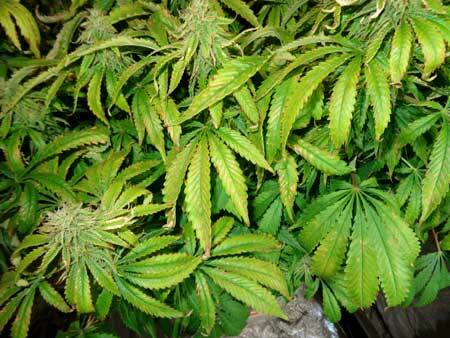 You'll also get some tips to help make sure your cannabis plants do great even if it gets too hot! 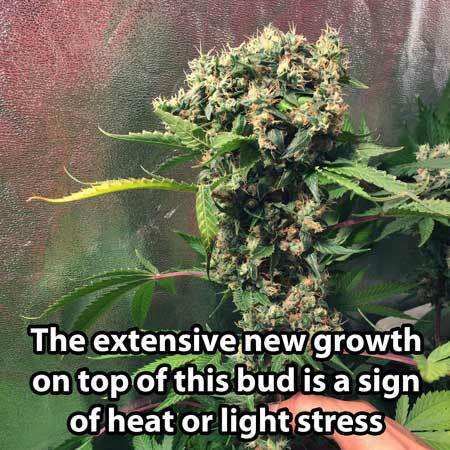 Sometimes plants keeps making new pistils on the parts of the buds that are closest to the light when they're experiencing heat or light stress. 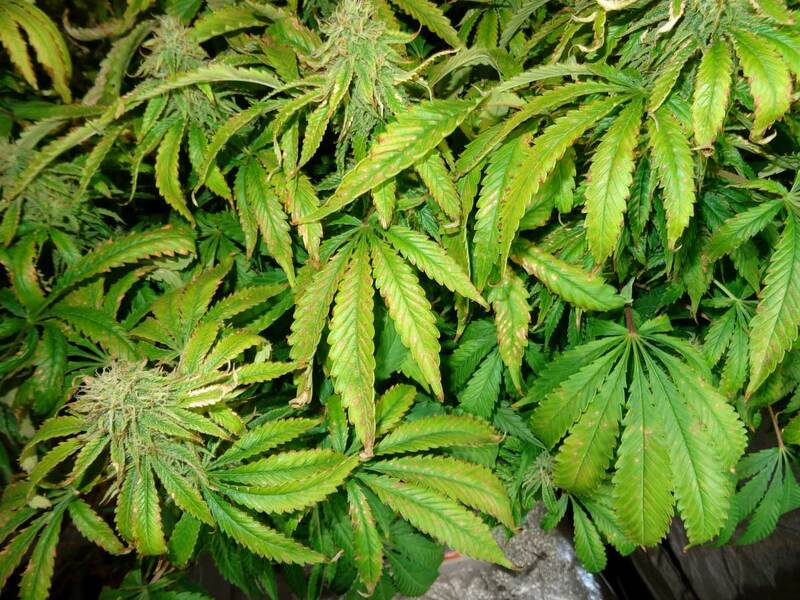 What can you do to protect your cannabis plants from heat damage? Some supplements can help protect your cannabis plants so they are more resistant and/or recover more quickly from heat stress. However, many different companies offer supplements and it can be confusing to decide which one – if any – is best for your garden. For the most part, there is no best supplement for heat (or anything really). A lot of different supplements will get you to the same place in the end. Because of that, when possible it's a good idea to choose supplements made by the same company as your nutrients instead of trying to find the "best" supplement. This is because during the process of creating a complete nutrient lineup, nutrient companies specifically test their supplements to make sure they work together with the nutrients in their lineup nutrients without causing lockout or other unexpected problems. So if you're using the General Hydroponics Flora Trio nutrients like I do, it means it's much safer for your plants to add supplements by General Hydroponics if possible. If you were using Botanicare nutrients you'd look at the supplements that Botanicare carries, etc. 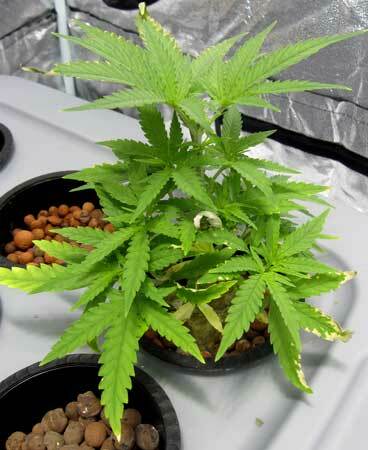 Learn about different types of nutrients for growing cannabis. Use supplements to help protect your plants from heat damage! One of the best inoculants against heat stress is a surprising gift from the ocean; seaweed! As a bonus it contains small amounts of trace nutrients and minerals. Many different nutrient companies use seaweed kelp extract as part of their supplement lineup, which means you have a lot of choices to choose from if you want to incorporate seaweed into your grow. A few companies offer seaweed extract by itself like Neptune's Harvest Liquid Seaweed which are a great choice for those growing outdoors or in super soil as they contribute to a healthy soil web matrix. If your nutrient company doesn't offer a specific Sea Kelp product, you can almost always find sea kelp extract as an ingredient in one or many of their supplements. For example General Hydroponics has a great all-in-one supplement called Floralicious Plus that contains several ingredients that work together to not only protect your plant against heat with seaweed extract, but can help it to produce better in other situations, too. When starting out with supplements, it's often best to start with something that matches your base nutrients and has sea kelp extract as an ingredient, like Floralicious Plus by General Hydroponics. Supplementing your plants with extra silica (listed on the label of supplements as Potassium silicate) is not usually needed for healthy plant growth. There is almost always some amount of silica available and plants don't need a whole lot of silica to survive. That means if your plants aren't stricken with a – super rare – silica deficiency and are living in a great environment, adding extra silica might not give you tangible benefits. However, if your cannabis plants are under specific types of stress or are generally living in adverse conditions, extra silica can make life easier for everyone! Plant roots with access to silica (Si) happily drink it up and the silica gets incorporated into plant cells, increasing the strength of individual cell walls. These "armored" cells help improve the hardiness, vigor and structure of the plant in many ways. Silica increases the microscopic "abrasiveness" of leaves, which can act as a deterrent to pests and herbivores (like deer). In fact, if you've ever been given a paper cut by a piece of grass, you can thank silica for making those "sharp" edges. Silica helps plants get the nutrients they need. Silica is effective at making phosphorus more available to the plant, which can be helpful in the flowering stage when the plant is going through phosphorus at a much higher rate due to the process of making buds. Silica can also help the plant roots better absorb micronutrients (including boron, copper, iron, manganese and zinc) while making it harder for the plant to absorb certain toxic substances like aluminum and salt/sodium. So again, silica won't magically increase your plant growth, but it can help make up for some problems with the environment. Because of this, nearly all professional nutrient companies carry a quality silica supplement as part of their lineup. I like Armor Si by General Hydroponics, but again that's because they make my base nutrients. There is a silica supplement available from almost every major nutrient company out there and you're least likely to run into problems if you go with the company that matches your nutrients. Note: Silica supplements (or more specifically Potassium silicate) will raise the pH of your water, so you may need to use a little bit extra PH Down. Learn more about pH. When growing cannabis hydroponically (and to a lesser extent when growing in soil or coco) it's very easy for your roots to start running into problems like root rot when the temperature starts getting too high. The types of microorganisms that attack roots thrive in hot, wet conditions without much oxygen. 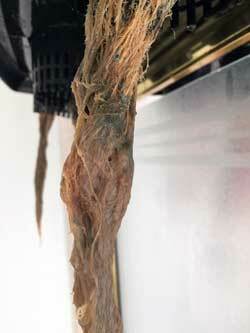 So not only does heat bother your plants directly, the roots may become diseased. Unfortunately, in hydroponics your water can't hold as much dissolved oxygen when it's hot, and dissolved oxygen is one of the best ways to fight off root disease. So it's sort of a double-whammy for plants grown hydroponically when it gets too hot in the grow room: they're getting less oxygen AND becoming more vulnerable to root rot. Besides using an air pump with large air stones to create lots of bubbles in your reservoir (learn more about growing cannabis hydroponically), the best thing you can do to keep roots healthy is control the heat. Unfortunately as you know, controlling the heat is often easier said than done! Luckily there are some products that are made up of beneficial bacteria and other microorganisms that specifically fight root rot. These work by out-competing the bad microorganisms in your water reservoir and populating your reservoir with friendly ones that actually help your roots. My product of choice for fighting root rot is Hydroguard by Botanicare. Normally I only use nutrients and supplements by General Hydroponics but in my experience this product has been the best for fighting root rot in DWC / hydro, so I use it specifically. I'm definitely not saying it's the best root supplement out there, but it's the best one I've ever used and I want to recommend something I know for sure will work. It doesn't change the pH of the water, and it doesn't interact with other supplements. I've seen it actually fight root rot directly, even when its hot, and I never go a grow without it. I'll be honest, I grow hydro and my grow room is too hot for most of the year. Because of that, every time I stop using a root supplement like Hydroguard I can see my roots start getting slimy, sometimes within a week. But as long as I use a teaspoon of this supplement with my reservoir changes I have white, healthy roots even in the heat! I realize this isn't a direct method to combat heat; rather, it's a way to help deal with the consequences of too-high heat when it can't be controlled. It's best to control the heat in your grow area, but if that's impossible Hydroguard will help keep your roots healthy in DWC / Hydro! It's cheap and a little bit goes a long way. A 1-quart bottle will last you more than one grow! Plants can easily survive in temps up to 95°F (35°C) when the air is being supplemented with extra CO2. 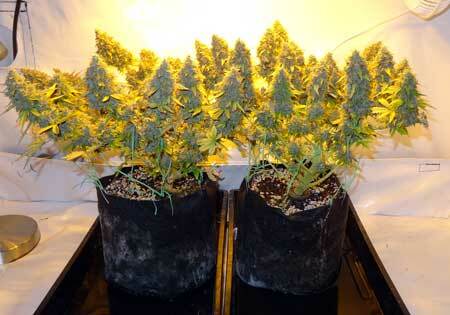 However, for CO2 to make a difference to your plants, you need relatively strong grow lights (i.e. not CFLs or T5s). But for those with HPS or LED grow lights, adding extra CO2 can result in faster growth as well as making it so plants can better handle the heat. 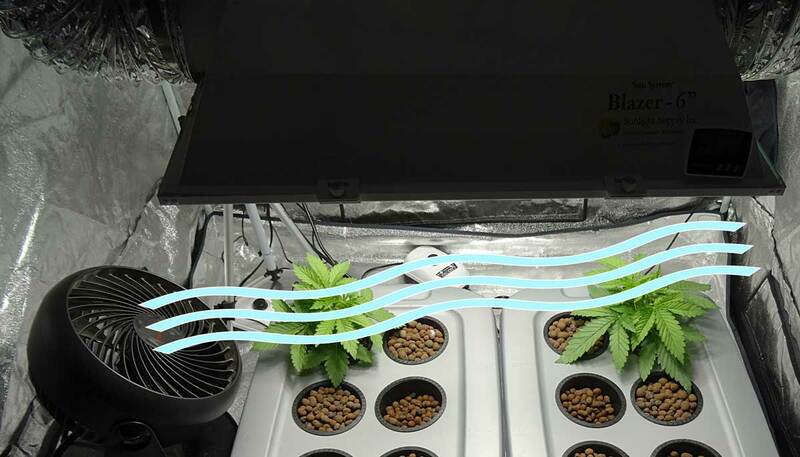 Growing cannabis hydroponically can give you some of the fastest growth rates of any style of growing, but as mentioned earlier, hydro does not really play well with hot temperatures because too much heat tends to trigger root problems and slower growth. We talked about supplements that help prevent root rot for hydroponic plants, but the next step is to cut out the water reservoir altogether and go for a hand-watered grow. That's because hand-watered plants are inherently much more resistant to high temperatures. Not only are the roots relatively safe from the heat (unlike in hydro) but the growing medium can hold a lot of oxygen no matter what the temperature (a lack of oxygen at the roots causes major problems in hydro). Soil in regular containers is probably the most common way to grow cannabis indoors, and that combo works great. But when it comes to growing in hot temps, coco coir may be a better choice than soil. In particular, coco coir inherently has properties and hormones that encourage healthy root growth and promote hardiness against heat. Choosing Smart Pots (fabric pots) over a regular container will also help with the heat. Smart pots help increase evaporation, which not only decreases the chance of overwatering, it keeps roots healthy by providing plenty of oxygen from the sides. 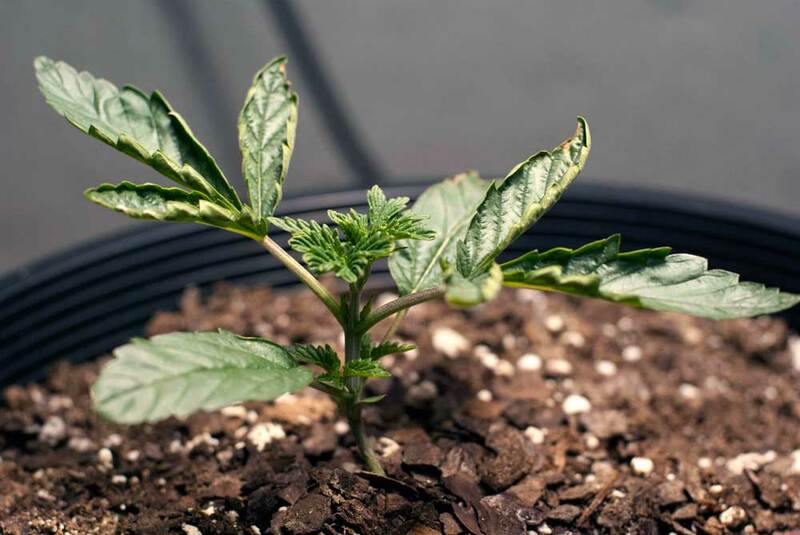 Growing cannabis with coco coir in fabric pots is one of the best ways to grow if you want your plants to be able to resist the heat. These coco-grown plants were regularly exposed to temps that crept up over 85°F (30°C), and although that wasn't ideal they made it to harvest just fine. Your plant is much more resistant to heat if the roots don't cook too, whether you're growing in a pot or in a hydroponic reservoir. If you can find a way to help keep the roots around 70°F (21°C), your plant will suffer less and recover more quickly from a hot spell! Watering your plant regularly when it's hot will definitely help keep roots from drying out, and adding mulch on top of your soil can help retain moisture and keep roots cooler. Placing your potted plant inside a bigger, ceramic pot (or otherwise finding a way to block the pot from direct light) can also help protect roots from the heat! Air conditioners can easily control the heat in any room but they use a lot of electricity, which can get expensive really fast! Unfortunately, a lot of growers are using an AC (or just dealing with too much heat) when they could actually reconfigure their fans to be able to maintain the right temps without needing an AC at all. Proper fan placement can also help save costs because if you use fans more effectively you can use less of them. Fans use a surprising amount of energy that can really add up over time. In a 4-month grow with a 250W light, I spent a total of $161 for the electricity of the grow light, yet I spent $107 to run an exhaust fan and two tiny oscillating fans. So the fans used a significant amount of my total energy used, which means you also don't want to be filling your grow space with tons of fans if you don't need to! Being smart about fan placement can save you a lot of money! Your exhaust fan should be strong enough for your space (for higher powered lights, use a real exhaust fan instead of a cheap ducting fan). Learn more about choosing the right exhaust fan. Heat rises to the top of your grow tent/area, so make sure your exhaust fan is located at the top of tent pointing out. You want a lot of area to intake air, about 4x the size of your exhaust hole if possible. With grow tents, this is usually accomplished by opening multiple port. When the intake hole is too small it’s hard on your fan, the exhaust won’t be able to vent as much hot air and the walls of your tent will bow. The intake hole should have direct access to cool, fresh air. The inside of the grow space is always going to be at least a few degrees above the temperature of the intake air, so if the intake air isn't cool the grow space will be even hotter. Cool air stays lower to the ground, so make sure your intake ports are as close to the floor as possible. Keep all ducting as straight and short as possible. You want a short direct line to the window so that hot air is immediately vented outside. Try to avoid using anything in the window that restricts airflow. Though it’s often necessary to use some type of screen to make sure no one can see in, try to do the best you can to obstruct airflow as little as possible. How can I set up an exhaust that looks normal from outside? 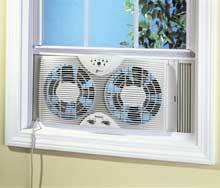 It may seem simple, but if your actual room is hot, a window fan blowing air outside can be surprisingly effective. They can help keep your room a few degrees cooler which means they'll help keep your plants cool. I sometimes call this a "No-Ducting Exhaust" but honestly it's more like a 'poor man's exhaust' if this is the only thing you're doing to vent out heat. But that doesn't mean it doesn't help! In order for a window fan to cool a room most effectively, there needs to be some sort of “intake” for cool air to get in. It's like a bigger version of an exhaust system. A separate open window in the same room is perfect, though an open door can also help, especially if there’s an open window somewhere in the house. However, even in a completely closed room, a window fan can help keep temps down somewhat in the room because it helps vent out heat from the grow light. 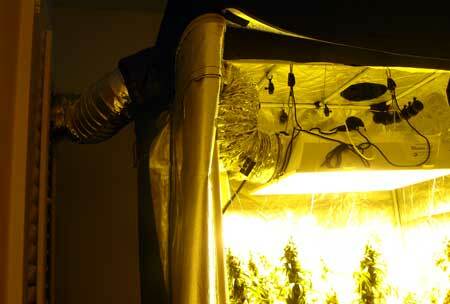 Oscillating fans are perfect for reducing “hot spots” that form in the grow space. Particularly "wing" type reflectors can cause major hot spots because the heat from the light is beaming directly down onto the plant. If it’s really hot directly under the light, using fans to blow that heat away from your plants can make a huge difference in how much heat they experience. In addition to oscillating fans, using a strong-enough exhaust fan with a big intake hole helps keep everything moving so hot spots don’t form. Just be aware that adding oscillating fans doesn’t bring down the overall temperature in the tent, they just move air around! There are several ways you can optimize your grow lights, up to and including upgrading to better ones! Some grow light ballasts are "dimmable" which means they have different power settings, allowing you to reduce the power of your light. For example you might be able to set your grow light to 80% or 60% power. 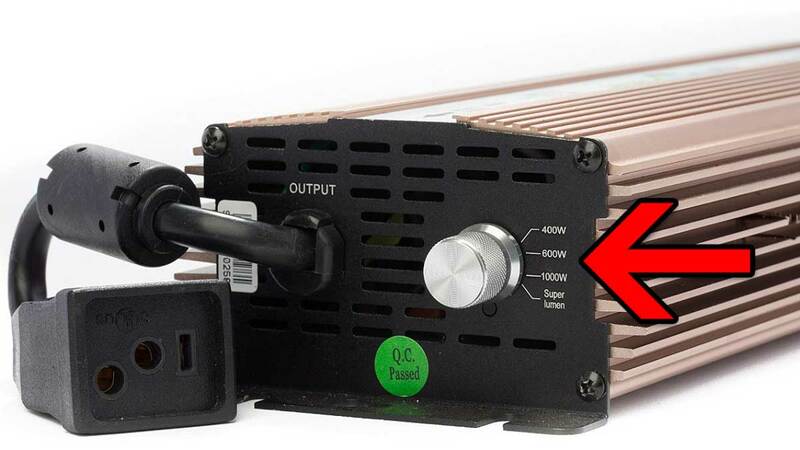 Some also will let you set the power by choosing 400W, 600W, 1000W etc. In these modes your grow light will use less power and give off less light/heat. If there’s a heat wave coming up, it might be helpful to turn down the power until things cool down. Raising your lights tends to help bring down temps experienced by the plants, especially with big CFLs and MH/HPS grow lights. Getting a lot of light can make plants more likely to suffer from heat, so another bonus of moving your lights further away can help them be more heat-resistant. Learn more about how far away to keep grow lights from your plants. 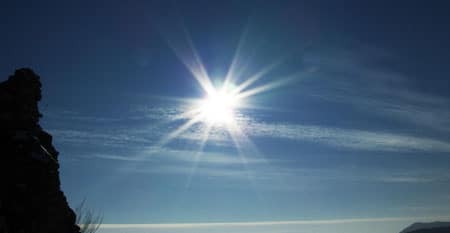 Too much heat will hurt your yields by making plants grow poorly, so having the right size light for your space is actually more important than the size of the light. In some cases, getting a smaller light can actually increase yields, especially if the heat is out of control with your current light. If you’re using a MH/HPS grow light, consider stepping down a size. For example a 250W HPS can still yield over 5 ounces, which may be enough for some people, yet runs much cooler than the 400/600/1000W variants. For example, if you’re using CFLs and are dealing with too much heat, then LEDs are could be a great choice for you. This is because LEDs are much more efficient than CFLs and put out less heat for the same amount of electricity. 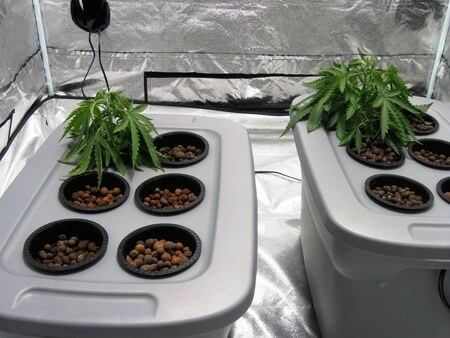 The only possible downside is you need to have extra height for LEDs because an LED panel needs to be kept at least 16-18” above the tops of your plants for the best results, while CFLs can be kept just inches away. Learn more about CFLs vs LEDs. 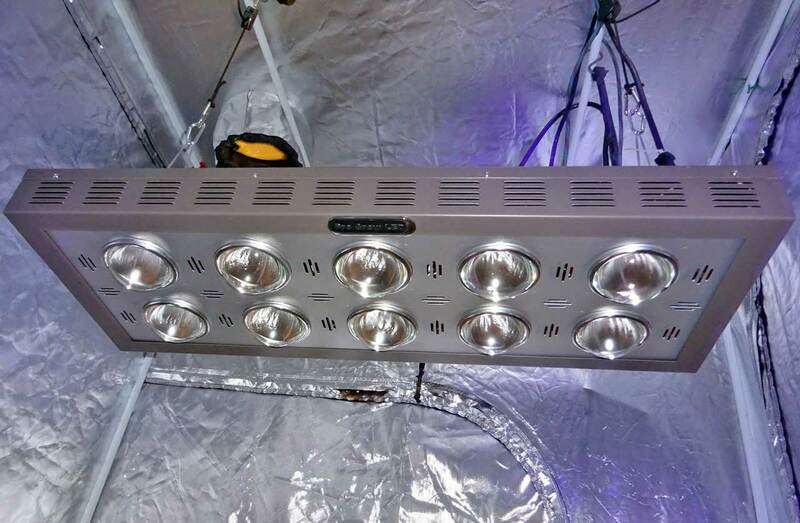 Although LED grow lights don’t necessarily get bigger yields/watt than an HPS grow light, they tend to come in smaller sizes and have built-in heat sinks and fans to blow hot air up and away from the plants. 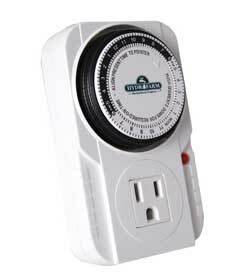 This can make a big difference as far as how much heat is being felt by your plants. Just know that if you switch from a 600W HPS to an LED grow light that pulls 600W out the wall, that the amount of heat they put out is about the same – it just gets distributed differently. LED grow lights are more suited for a situation where you can’t really have an exhaust, and they can just be plugged in and hung above your plants. However, if you have the ability to vent out hot air with an exhaust fan you may want to go with MH/HPS because they come with air-cooled hoods that give you great control over the temperature, and produce great yields with dense buds. Learn more about HPS vs LEDs. Many growers give their plants 24 hours of light a day in the vegetative stage, and although this results in the fastest growth, having the grow light off for several hours each day will dramatically help keep the temperature down. Although plants may grow slightly slower under this light schedule, 18/6 is a common choice for growing cannabis in the vegetative stage and here’s why: Although you want to maximize how much light you’re giving your plant, giving as much as possible doesn’t necessarily give the best results. Many growers believe (myself included) that you get diminishing returns after 18 hours of light a day. Although plants do grow faster if they’re getting more than 18 hours of light a day, I don’t believe the increase in growth is big enough to justify the extra electricity and heat. 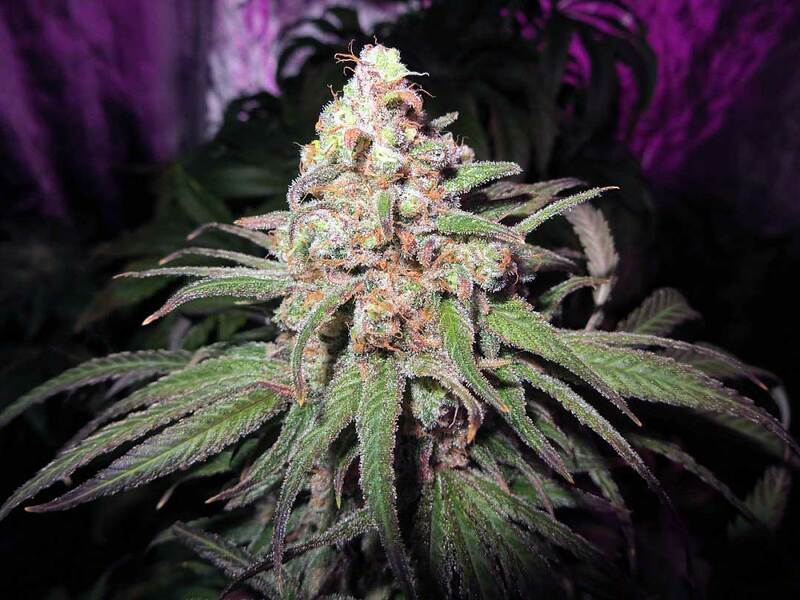 In my experience, cannabis plants benefit from having a night stage that helps make up for the lack of extra light, so that the difference between 18/6 and 24/0 isn’t very noticeable. However, the reducing your lights-on hours can make a huge difference on your electricity bill and the temps in your grow space! I’ve grown many plants on both 18/6 and 24/0 schedules before, and didn’t notice much difference between the two. This is a super simple solution to help control the heat for growers who get high temperatures in the middle of the day! Have your lights set to turn off during the hottest 6 hours of the day and you're done! 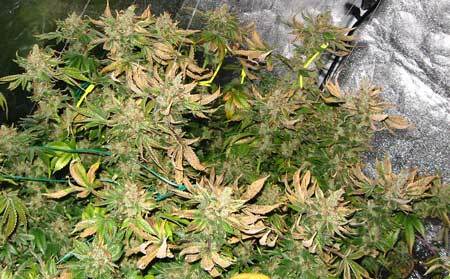 Some strains are inherently more resistant to heat than others. 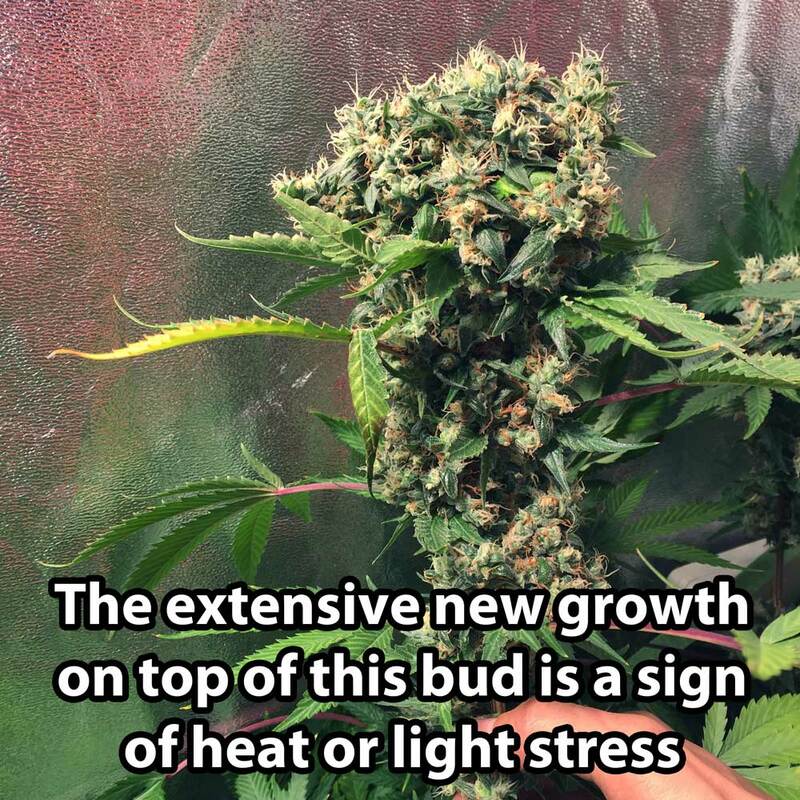 For example strains that originated from the equatorial region, including many Sativa and Haze strains, can resist much higher temperatures than strains that originated in colder regions, such as many Indica strains. 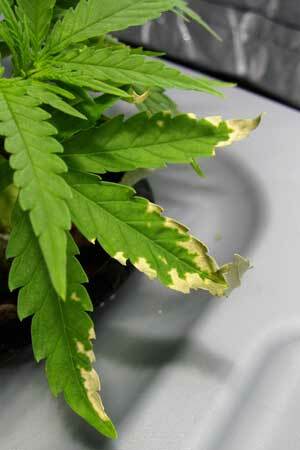 Avoid Auto-flowering Strains – The ancestor of all auto-flowering strains is a type of wild hemp known as Ruderalis. This plant originated from Siberia which is very cold for most of the year. Because of this part of their ancestry, many auto-flowering strains tend to be less resistant to heat, especially if they're mixed with a lot of Indica strains. If you have experience with a great heat-resistant cannabis strain, please contact us! Most importantly, take extra good care of heat-stressed plants – try to baby them as best you can! How do I produce top-shelf buds every time?